This week has been a bit different than most. My daughter started a two week program where I am doing a lot of driving everyday. We are also starting to get ready for back to school. This was the last summer before my son graduates, and I am not really looking forward to going back. Tonight I had a girls night with some of my friends, and ate this entire banana split! This afternoon I wrote about post about what happens when It Rains on Your Party. I thought I had hit publish, but I just found out when I got home from my night out that I didn't. Ooops! I will publish that post this weekend. Because I have been on the road all week, I did not really have the computer time to share features. I will have a few from last week's party, and will still be sharing them. Are your kids into Harry Potter? My co-host Kim has a really fun party Harry Potter post. 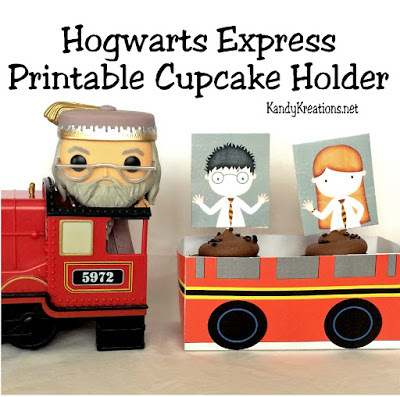 Free printable Hogwarts Express and Cupcake Toppers over on her blog Kandy Kreations. Now it is time for this week's party. You are welcome to share anything that you would like to share. This party is also shown on Kandy Kreations for double the exposure. If you are chosen as a Dare to Share Feature, your post will be featured on the blog and social media. Kim also chooses posts to feature on her blog and social media.